Ricky and I had been assigned to do a project together in first grade. It was near Thanksgiving and in the spirit of the season, we were partnered up and given some modeling clay. All we had to do was to make some food from the First Thanksgiving. It wasn’t truly difficult; we were in first grade, after all. I had all kinds of ideas about what we could make. I was actually excited about it and was eager to get started. The two of us went to Ricky’s house, since it was closer from school. I had never been over to his house before, but his family was nice and his mom got us all situated with a table to work at, just for the two of us! This never happened at our house. We rarely had a room, let alone a table to ourselves to work on something. Ricky was an only child, so he didnt have to share. It was exhilarating! I spread out, ready to create some art. I loved working in the clay, especially art clay. It was different than Play-Doh, which is what I usually had to work with. I loved using Play-Doh, but I hated the smell that lingered on my hands. It would make me gag afterwards and I would scrub it with the most caustic soaps I could find in order to get rid of it. But modelling clay’s smell was wonderful. It was soothing and more earthy. The colors blended better than Play-Doh, which almost glowed with its color, screaming “toy” versus “art”. I was mortified! “We don’t have much clay, Ricky! You should start with the other vegetables!” He wasn’t listening to me. “Ha ha! I made some yellow eyes!” He held them up in front of his own, leering at me. He was giddy with laughter and I knew that I couldn’t depend on Ricky any more. He was like the guy on the desert island who ends up spilling all the water. His eyes were crazed as he started work on a foot. A red foot! “Give me that!” I demanded, grabbing the rest of the yellow and starting on an ear of corn. I knew that I had to think for myself at this point. I tried to make some squash with the leftover yellow. I had to take some of the red, left over from the foot Ricky was making. In the end, I molded the foot he had started into a crude pepper. I smiled. It was looking rather brown. Ricky had put me in a real mess, all right. I didn’t know how we were getting out of this. I surveyed our horde… not much to speak of. We had two pumpkins, a few squash, an ear of corn. Courtesy of Ricky, we als had two poorly formed butts, a pair of yellow eyes and a foot. I formed the two butts Ricky had made into a another pumpkin, to Ricky’s yells of protest. “Those butts are mine!” he howled. “Listen!” I screamed. “Your butts have to feed the pilgrims through the winter, stupid!” He had the grace to look ashamed and I continued to save our butts, finishing our project. In the end, we displayed our harvest the next Monday morning at school, among all the other kids’ projects. Dismayed, I saw more than a few questionably shaped fruits and vegetables. I’m sure I saw a car shaped tomato and a banana that looked like a rocket. I realized that the point of this was to think about Thanksgiving and about what we were all thankful for. I smiled as I gave thanks that I didn’t have to survive the winter depending only on my fellow classmates. exact crater made by the fruit. This was our own fault and we knew it. We’d also get some homemade cookies and a personal note. I’d try to read this note ahead of time and pocket it because a note from your Mom at lunch was good for at least a few hours of good-natured teasing. I got picked on a lot as it was… I didn’t need to give them reasons. One day, I was in a hurry to get to my ride. Sometimes my grandfather, Pa, picked us up early to get to school. Other times we’d walk to a bus. But invariably, we were late leaving the house, our shirts not tucked in, our ties still not tied. We were trailing homework from our books and had to grab various things on the way, a book, our coats, our shoes. It was almost a reverse circuit of the house that we had made the previous afternoon. Clever detectives could probably deduce how old each child was and often how badly they had to go to the bathroom, because the trail would end there. communion each Sunday at church and it carried over through the week. She could also quickly administer any first-aid on the way out, because she was the resident doctor of the house, as well. surprise them out of our bodies. It certainly caught us by surprise. Finding nothing, she’d send us on our way, off to wreak havoc outside of the house. “I- what?” I opened the bag and started laughing with Kevin. Inside the bag were five peaches… not my lunch, which I’d been expecting. to well up with tears and bawl. There were 5 peaches in this bag and there were 5 of us besides my Mom. She bought peaches for everyone in the house but her. I have to take these home. I’m going to fail the family if I don’t get these peaches home! long enough to eat them! Recently my wife Lisa and I have been indoctrinated into the cult of Tivo. Digital Video Recording is an amazing experience for us and has taken us off of network scheduling. It really is TV at the touch of a button and I’ve felt like George Jetson. We may watch more TV, but the TV that we do watch is on our time. Our life doesn’t revolve around the hour or half-hour any more. If we’re a little late after work and don’t get to the show when it starts, no matter. We can watch it from the beginning while it’s still recording. I feel like I’m in a time machine. The last time I watched a DVD was weeks ago. I haven’t sullied my hands with a tape or DVD in weeks. Because everything is digital, there’s nothing to unwrap, open, misplace, degrade or scratch. It’s all in the remote. I feel like a Roman emperor seated on a divan pointing a sceptre. Of course, this makes the remote an almost holy thing. It sits on a shrine. Lately I’m wondering if I’m paying enough attention to the remote. But Tivo has changed our lives in more ways than that. Because of Tivo, we have to redecorate our entire living room. I’m glad that I’m saving money on renting and buying DVDs, because we need this money to buy new furniture. Let me explain. When the service man came to install the unit, he was quick and knowledgable. I might be a little affected by all of those customer response surveys, but all of the Direct TV people get “five out of five” in satisfaction. Especially with their cleanliness and appearance. Before these surveys came after installations, I never thought to grade them on their appearance. As soon as they’re not looking, though, I start making notes. I always check in the most flattering rating unless the installers actually smell or emit noxious fumes, neither of which has ever happened. Installation of Tivo went fine, but there was a small problem in fitting the unit into our entertainment center. There was just not enough room in the cabinet to fit everything, so it had to go on top, along with two other units, a receiver and CD player. As much as we enjoy our new appliances, we now need a new entertainment center. We choose and purchase a new piece of furniture and are delighted when it arrives at our door, solid and made with sturdy wood. This is a terrific unit, about as solid a construction of wood that I’ve ever purchased. I feel proud as it comes all together. There is surprisingly little swearing uttered as we move pieces from the old unit (which has started to sag) into the new piece. In the back of this excitingly solid amoire, there is a solid piece of wood. The existence of this solid piece of wood is captivating to me and I stare at it with a certain sense of awe. Most of this type of furniture in the past had cardboard or particle board backing or it was in two or more pieces. Not our amoire! This is solid wood, securely fastened with 27 small screws around its edges. In the center, looking like an afterthought is a round two-inch hole. This is where we need to thread all the wires, cables and power cords. A few hours into the operation, I’m covered in sweat, holding a lamp since the flashlight broke. I’m stuffed like a Pillsbury crescent roll into the guts of the unit. I’m reaching towards this two-inch hole like a diver’s last source of air and light. As we attempt to thread all these black cords through the tiny holes, it occurs to me that this has been designed for human brains to assemble, but we are the wrong customers. This furniture can only be put together by monkey people. These are beings who I have surmised are of exceeding brightness and intelligence, but also possessing very long legs and arms to latch onto tiny places in shelves to hold ends of cords. Neither of us had thought it would take very long, perhaps a half hour. I had taped and labeled all of the cords ahead of time and I knew where they should go. We hadn’t figured on needing the agility of a spider monkey. It was the monkey people joke that kept us laughing instead of yelling at each other. We kept laughing after two hours only reverting to very short, hastily spoken answers sometimes barked. At one point some cords had to be replaced with longer ones, but we managed to fix that with a quick run to the basement. Moving the TV was the hardest part. This TV has a 29 inch screen. It’s very nice, but not the most expensive or even largest. Even so, there were some apparent handholds in unlikely places. Some of these looked more like places to get your hands stuck rather than actual grips. Some looked like mock handgrips, as if the manufacturers were taunting us, “Yes! Grip it HERE and watch it flip forwards onto its expensive TV screen!” There were no handgrips at the very bottom beneath the heavy and extremely fragile picture tube. Still we managed to lift it up onto the shelf without shattering the TV or any bones. I think that this part of the procedure would have also been easy for the monkey people to accomplish. They might even have laughed. I’m sure that none of them would have made the noises that my wife and I made. I couldn’t decide if I should crush my fingers beneath the TV first, then wait for my wife to get her hand there or wait for her to yell, “Lift! My hand is getting crushed!” before I acted. The good news is that I don’t think that we have to worry about anyone taking this TV. It is not moving from this spot. As it neared midnight, we were just a few components away, but cords were still disconnected and the TV was sideways. We were both nearing the end of our patience and ability to answer in calm, non-swearing answers. I saw Lisa with a screwdriver in hand behind the amoire. “What are you doing?” I screamed, perhaps louder than I’d intended. I was like the guy who panics in the disaster films, the one who ends up losing all the water. I had to reign myself back. “I’m going to remove these screws!” she yelled. She sounded like someone in a hostage situation on a TV crime drama. I moved in to talk her down. “We can take this entire back piece off!” Lisa moved in with the screwdriver and started to turn the first screw. Lisa did put the screwdriver down and we started to place the last components in. “Monkey people,” I cried and we shared an uneasy laugh. We reconnected everything and started moving things back into place, checking all the cords, plugging everything back in. I was filled with an eager confidence. I didn’t have any parts left over and everything was lighting up the right way. I turned on the TV with a flourish and smiled as it flashed the lovely logos that let me know that these were the people I’d be paying to get all of this great stuff to work. I always think it’s funny that you can always tell the poofed up logos from the error messages telling you something’s wrong. So when I see the logos, I know I’m all right. For about a week or so after installation, as I sat back to enjoy it all, I’d hear unsettling noises from around the house, as Lisa tended to the chain reaction of home decorating that the addition of one piece of furniture can cause. Things would be moving and I’d hear the sound of moving furniture, a pounding hammer… often in the same room that I was in. My wife doesn’t often tell me when things need to be moved. She just does it, often requiring my assistance only halfway through the process when something else is in the way. Sometimes it’s me that’s in the way. Lisa may be the kind of person who can move furniture right away, but I need a little notice. At least enough notice to get out of the way. After we moved the other furniture back into place and settled in to watch an episode of our favorite show, Lisa realized that we needed a new couch. Tivo, this is all your fault! Each day has been a new Corporate Hoop, which has given me a chance to “bond” with co-workers. Some of the bonding is actual, some of it is the same bonding you might get while you experience a disaster together. Today was one of the “best” and when I say “best”, I mean it’s fun to rant about it later. And in actuality, compared to freelancing and begging for work, this is a piece of cake. I was finally given an access card to allow me to enter in the building. Prior to this, a co-worker and myself “shared” one. By share, I mean that every time I left the office to get a snack, something to drink, lunch, etc., I had to bother them to borrow the card… or call them from my phone to tell them I was locked out. So today, nearly a week and a half later, I get an access card to allow me to get into the secure areas of the building. When I went out for some coffee, I tried the card. It didn’t work! Unfortunately, I hadn’t thought clearly and I was now locked out…. and the bathrooms were on the other side of the door. There are bathrooms on the locked side, but they require a secret code. When I finally buzzed back in the office, my supervisor told me to call an 800 number to have them activate the card. The logic of this had escaped me. Why had I been given a card if it hadn’t been made active? Anyone can give me an inactive card! Heck, I could have made one with some paper, some markers and some scissors (which I proudly had in my desk, behind the secure access door). I called the access # and listened to the entire menu (because their menu options may have changed) and got a recording from Lisa. This is a different Lisa than my wife. But she wasn’t in and I was told in a very clear and detailed message that if I was an employee to leave my user id and if I was a contractor to leave four digits of my social security number. I fully intended to leave all my pertinent info on the message, even my passport number, if that would help. Except that her message mailbox was, ha-aha. FULL. Yep! It was FULL. Either Lisa is one popular person, she never clears her messages or (I’m betting) a lot of people have this problem. Maybe it’s all three. So I called back, listened to all the messages again (in all that time, the menu very well could have changed) again and this time I got her directly. When I read the # of the card, she said, “It has to be activated.” Shrewdly, I said, “Ah!” So she activated it and said that it would be 24 to 48 hours before it would be active. In the meantime, I’ve been told by others in this group that a week and 1/2 is a FAST turnaround for a card. Because they still have their old “pre-merger” IDs. “What’s a long time?” I asked. 3-4 weeks is the usual time! I smartly told them that I hoped that my photo ID would still look like me when I got it! One summer, we toured the Smoky Mountains in Kentucky. We toured with one of my Dad’s good friends Lou and his family. On his own, my Dad is a lot of fun, but combined with his good friend, the two of them are hysterical together, at times even dangerous. Despite the amusement of seeing our good friends and their own three children, on long car rides, there isn’t a whole lot to do. We even brought our dog with us, but the novelty of having a schnauzer leap up and down off of the seats of the van grows old after the 47th time, even for the dog. No amount of toys in the back seat, scenery out the windows or 1970s rock tunes can ease the boredom, however comic books are a godsend. Many a comic took me away to an adventure of my own, whether it was having super powers and battling the enemies of the universe, laughing at the antics of Mickey, Goofy, Donald Duck and his nephews or even the (eventually) forbidden horror comics. These gruesome tales (of which Tales From The Crypt are based on) gave me more nightmares in dark rooms than anything I could dream up, yet I had to read on. They dealt with gruesome subject matter and the cover always showed something lurking in the depths of a basement that had me reading until I finished or the pages shook with terror. I was either reading a superhero comic or a horror comic when the family van made an unauthorized stop. Lou’s station wagon was not far behind and also stopped. My father and Lou left the safety of the vehicle to see what was going on. Apparently there was some commotion up ahead that had cars stopped in both directions. Dad and Lou decided to check out the situation. Fearless, curious and headstrong, they walked ahead, their wives staying With The Children. Most of the other drivers stayed in their vehicles, confident that the state troopers had things under control and they could continue driving. Of course, The Men knew that this was only the start of the adventure. Instead of driving to the adventure, the adventure had come to us! 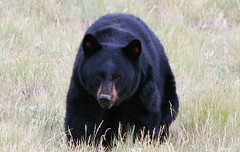 The adventure in this case was a huge monstrous black bear. He was nine feet tall and probably was just as bored as I was. He emerged from the trees to stake out the picnic sites by the side of the road, perhaps lured by the smell from the trash cans. He looked deceptively gentle and sweet, with huge furry paws that could have taken off the side of the van in an accidental brush. His huge teeth gleamed in the July sun, his jowls and moist nose quivering, torn between a free meal and the shiny cars making a continual racket. The ground seemed to shake when he lumbered in our direction and his growl shook the windows as if he were confused at this new audience. My father decided to capture his photo. With our mothers yelling both for the men to come back and for the kids to stay in the vehicle, they probably were disturbing the bear more than my father. Heedless of the danger, perhaps emboldened by the fact that this was free, they continued on. All the time, the other cars were honking, mothers were screaming and the bear was growling and roaring. I’m sure that this display wasn’t what the bear wanted and eventually he yawned, scratched himself and barreled back into the trees. This whole process delayed us by no more than thirty or forty minutes, even though it took some time to get everyone back into their vehicles. Eventually the cars ahead of us moved ahead and my father climbed back into the van. Sweating a little from the excitement, he had a huge smile on his face and he handed the camera to my quivering mother. He leaned back to make sure that the whole family was in the vehicle and he glanced over to me. I had missed it all! I blame it on my poor hearing, which has never been very good, or perhaps it was my devotion to reading. I have always been able to Tune Out The World when reading. Whatever the reason, in my search for something exciting, I had missed the best adventure of all. To this day, “What bear, Dad?” remains one of the family’s favorite phrases when one of us (usually me) has missed something unique that can never be repeated.